Hi Folks! 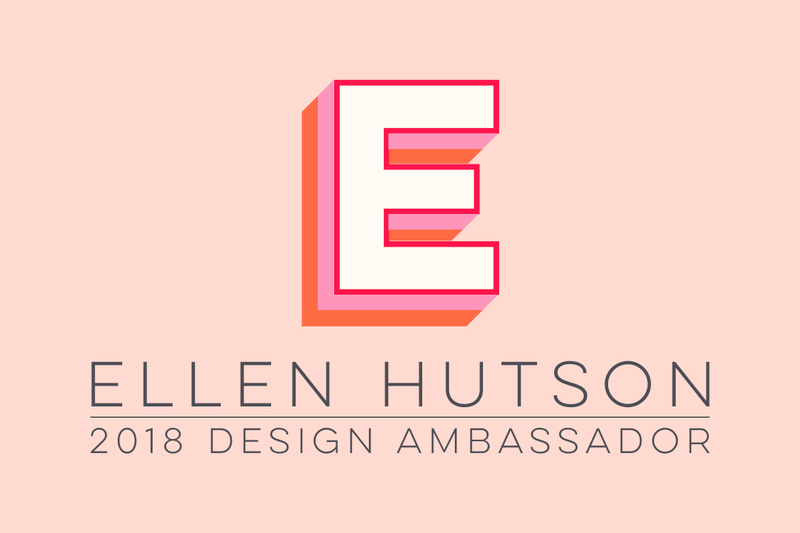 I'm so very happy to be representing Ellen Hutson in Altenew's Crafty Friends Blog Hop! 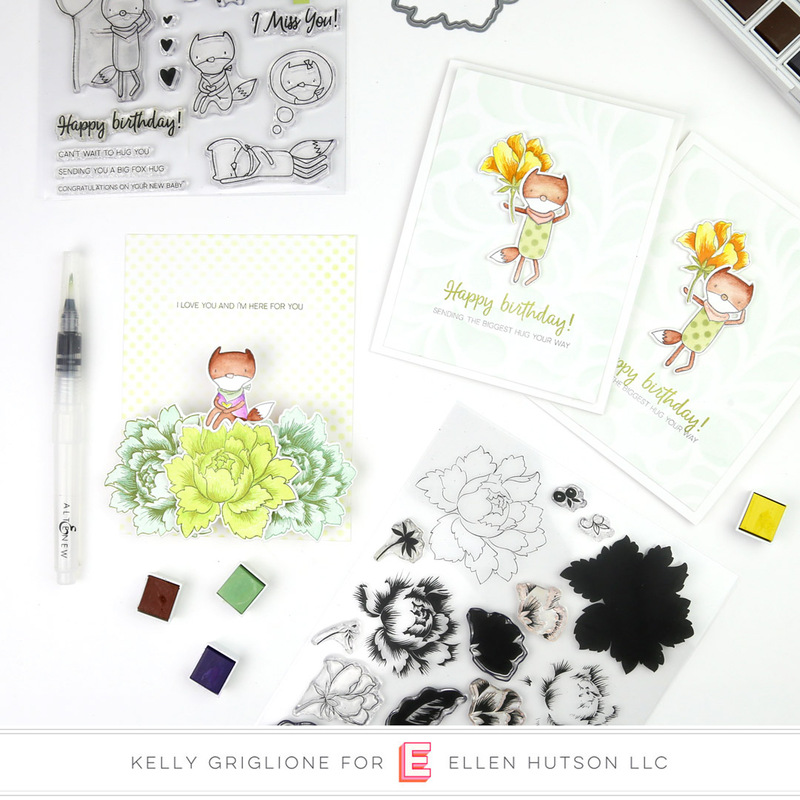 Head over to the blog where I share two cards that use the most unlikely pairing of sets ... the Altenew Hug Me set with cute little foxes, and the Altenew Peony Bouquet with giant, romantic peonys. This little guy is perched on top of the flowers, waiting to offer you support. The flowers swing out and are actually what allows the card to stand on its own. Wouldn't this look cute in someone's kitchen window sill? 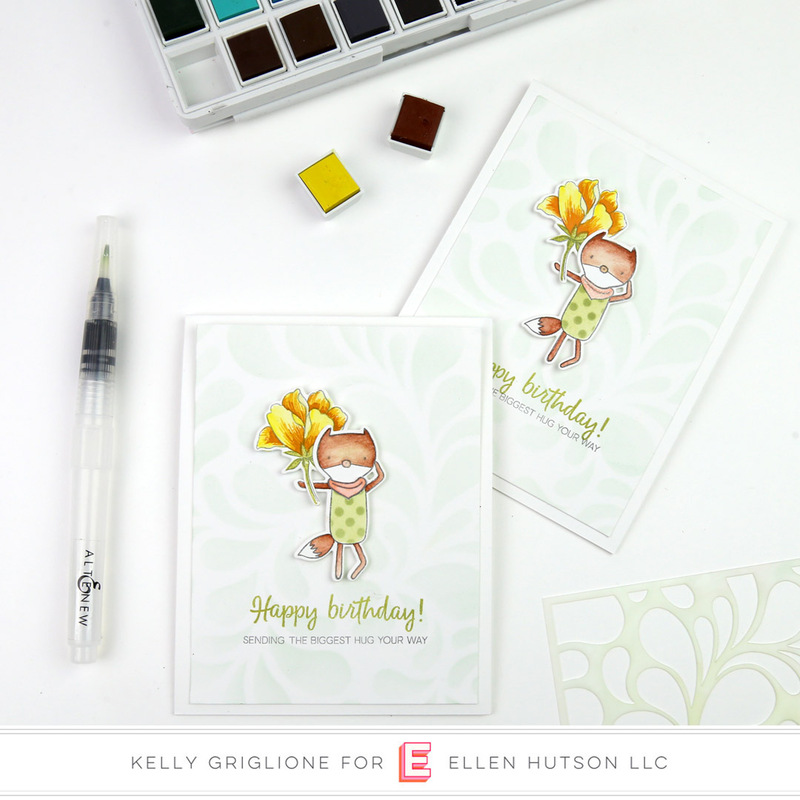 The other card features a fox presenting the birthday girl a delicate yellow flower. I really enjoyed using the Altenew watercolors. I've never been a big lover of coloring things in, which I know I'm probably in the minority here, but I'm happy to say that I actually had fun using these watercolors because they gave such vibrant results. 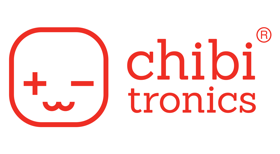 I've used them on most of the projects I've done recently. The background has some subtle ink blending through the Flowy Drops stencil. 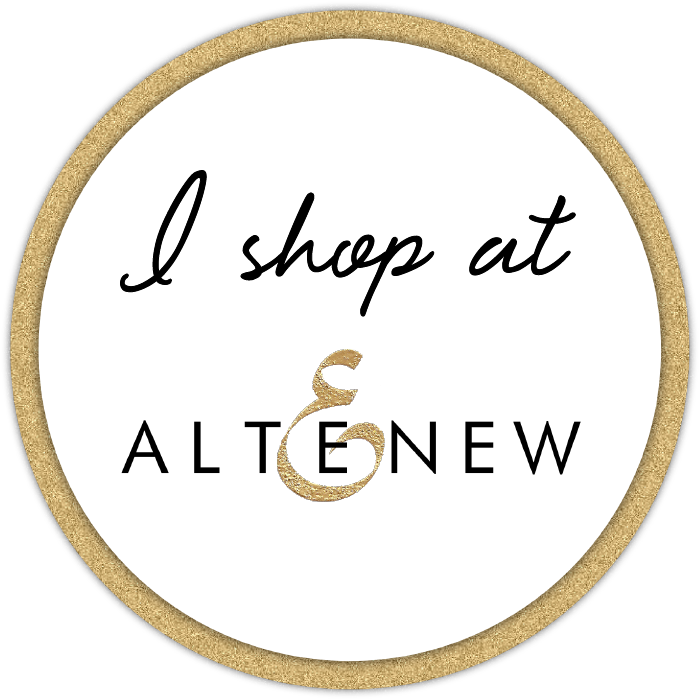 Please feel free to check these out on the Ellen Hutson blog, and take a look at the rest of the Altenew hop while you're there. Hello Folks! It's the last day of the Winnie & Walter previews for their latest release, and it's a doozy! 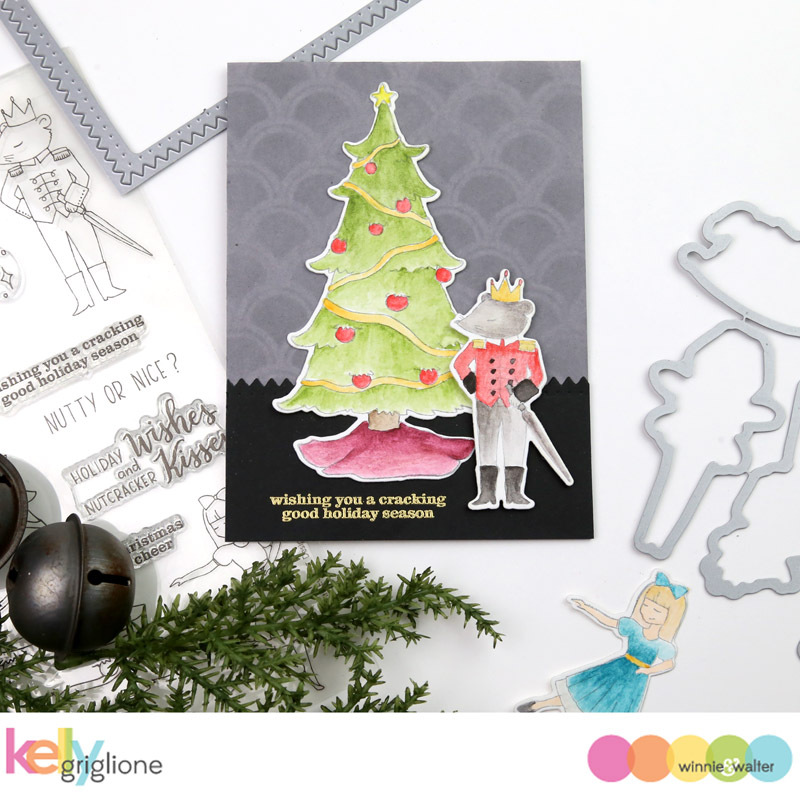 Today we have the unveiling of my favorite Yetitide Greetings set (which you saw "sneaks" of a couple days ago) and the Nutcracker Kisses set, both designed by the lovely and talented Evelin T Designs. Here we have the Mouse King standing in front of Clara's tree, offering holiday greetings. Or perhaps somewhat of a veiled threat against the nutcracker?!? Either way, I just love that sentiment! Don't think I've heard that one before. To color this set of cards I used a very dry brush with the Altenew watercolors to give it a "children's illustrated book" feel. It also worked out having the brush strokes visible for the Mouse King's fur. The black cardstock is cut with the long edge of the Tilda cutaway. And the scallops stenciled in the background is from an older creative screening called Madison. I picked that pattern because it always reminds me of wallpaper, appropriate for being in Clara's living room. Here's another humorous sentiment which I was dying to use. So I lined up the nutty guy and the nice girl over their respective words. The panel is cut from the smaller Tilda cutaway, and is just the perfect size for occasions like this when you want to feature something smaller on your card. Love, love the Peppermint Zone cutaway for the background. Not only is it striking, and just the right amount of pizzazz, but it also only took a few seconds to make. I call that a win! The black bottom is cut again with the longer side of the Tilda die. Be sure to check out the other amazing projects on the Winnie & Walter blog. As usual, leave a comment on the first blog post for a chance to win all the stamp sets in this release!! Thanks so much for coming back to see the last of the reveals. All of the stamps, cutaways and creative screenings go on sale this evening at Winnie & Walter! Hi Folks! 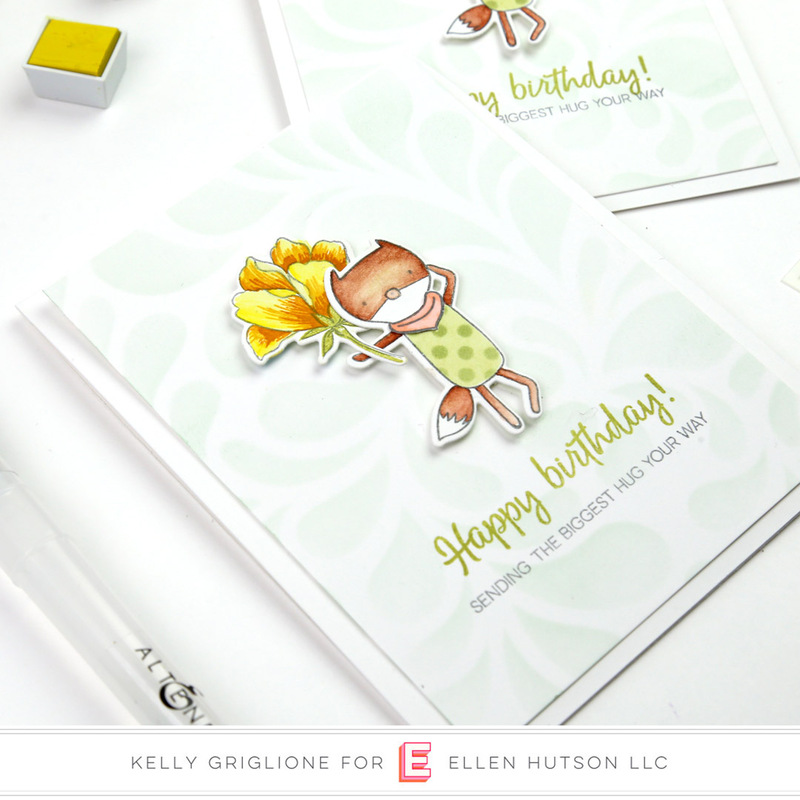 Day #3 of the Winnie & Walter release brings us another ADORABLE stamp and die set from Evelin T Designs ... Snowy Holiday. It features a snow globe with several choices of what to put inside. For this card I chose the big red guy ... Santa! You may have seen on my Instagram feed (notablenest) that I got a fabulous BOGO deal on Copic markers at Michaels the day before Thanksgiving. So you know I had to try my hand at coloring! It was a little overwhelming now that I have more than one color family of each color : ) Before, my collection of brown markers numbered two! I've got a lot to learn, but I sure had fun working on him! Especially the texture of his toy sack, since I wanted to make it look like there were irregularly-shaped items inside. The snow globe base was colored with a different brown family (what freedom!) I curved the sentiment to fit on the base, and then embossed it in gold. Then I masked the base off, sprayed adhesive on the dome, and then poured chunky glitter on top. Lots of sparkle! The zig-zag panel is cut from the Tilda Cutaways set of dies. Love how it ties in with the "special holiday delivery" sentiment, as it has the feel of a postage stamp when something is mounted inside the perforated frame. I can see getting a lot of use from this die for all sorts of cards. The background is made with the Pensylvania Polka stencil also available in this release. I sure had a lot of fun working on this card. And I know that there is so much more to explore in the Snowy Holiday set! We have one more day left of this new release. Hope to see you back tomorrow! 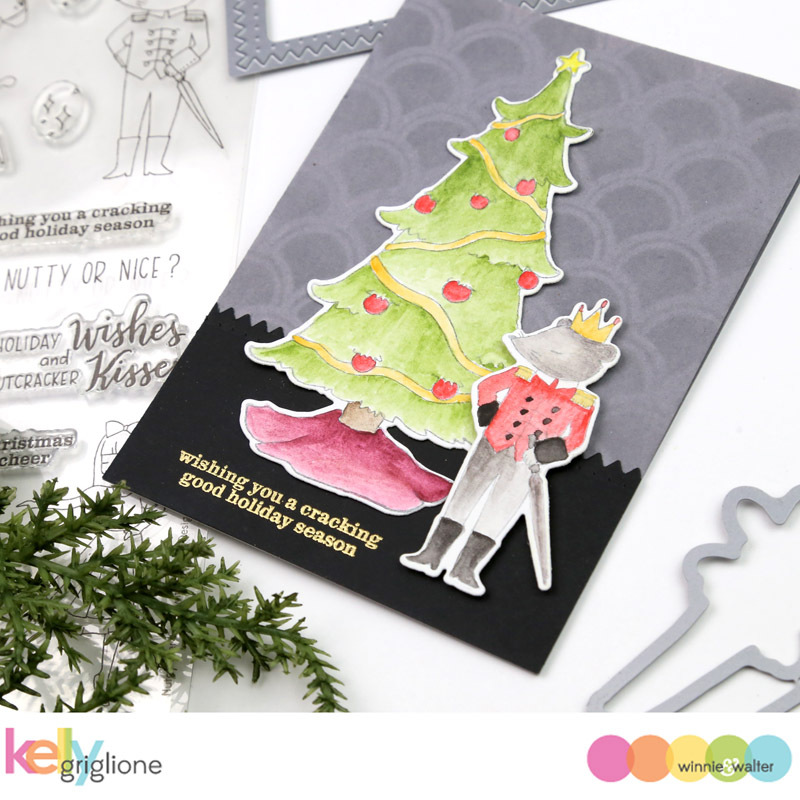 Winnie & Walter's new release continues today, as we feature the In a Word: Grand Merry stamp set and the Peppermint Zone Cutaway Die. I had some extra stamped sentiments from the In a Word: Grand Merry set, and rather than toss them, I made new card bases and adhered the sentiments to them. I removed the Yeti family pulling their sled full of presents (sneak of a set yet to come!!) from the original card and tucked them in between the snow drifts I hand cut. Since the sled is going downhill here, I bent that part of the die where the rope is pulling the sled to give it the right angle. And that tree, Love!! It is the middle of winter, after all. Here's a close-up at those cute Yeti's!! They really just make any project adorable. And, just like my favorite polar bears, they are WHITE, so not much coloring involved! This left the original card base without a Yeti, so I cut and colored the skiing Yeti, and had him cross country skiing through a pine forest. I appreciate that the Yeti set comes with the bare branched tree as well as an evergreen to make it easy for you to create a little scene like this. I've got the front snow drift popped up on a piece of cardstock, and the Yeti on some pop dots, to create some dimension in the scene. 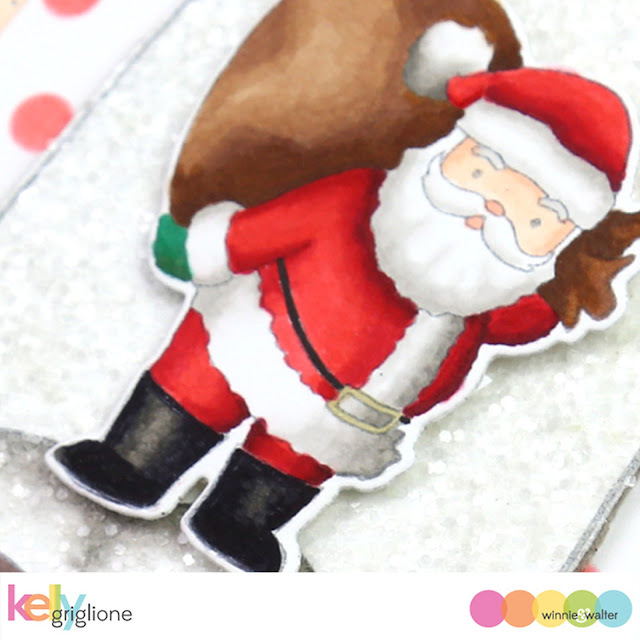 You may recall The Peppermint Zone stencil from a couple years ago, well now you can get it in a die! Here I cut it from red cardstock, and then cut it again with a circle die. I like how it makes a nice focal point to a card. Just perfect for a ... Yeti!! The peppermint is just adhered with foam tape in the center, so the tips of the swirls are all loose. This card really shows off how much I'm obsessed with the sentiments in the Grand Merry set ... they are just the perfect bold font and they all stretch the length of a vertical A2 card (with a nice margin on each side). Combining them is easy as they're all the same width. This Yeti is hiding behind a tree, looking to scare a passer-by. Silly Yeti! He's actually part of a trio of caroling Yeti's, but I just cut all of them off. You can see a few lines of the book they were holding under the tree. I like the bold red of the Santa hat tying in with the red "Christmas" sentiment. 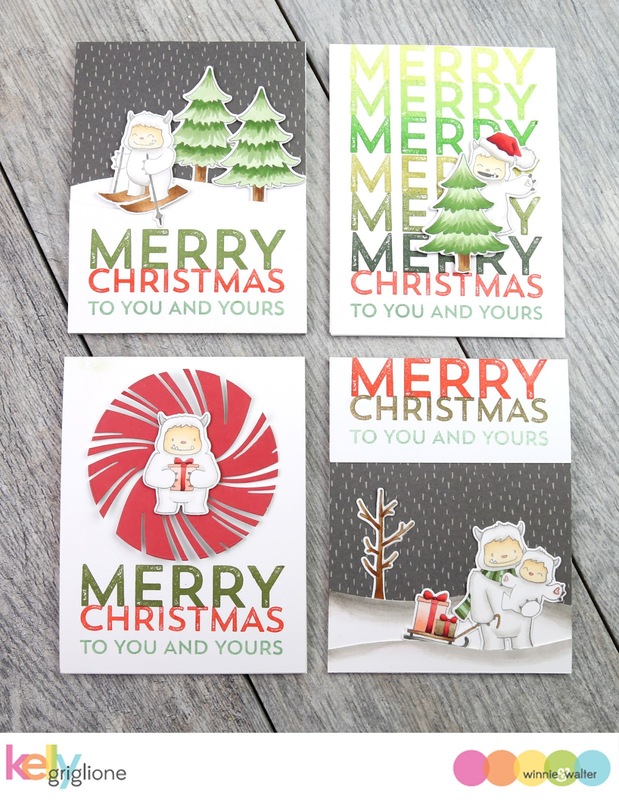 And there you have it, a quartet of Yeti Christmas cards! I really can't tell you how much fun I had with these! As nutty as I am about the Yeti's, and the Grand Merry sentiments, I've got another set I'm dying to share with you tomorrow! Hope you can stop back.